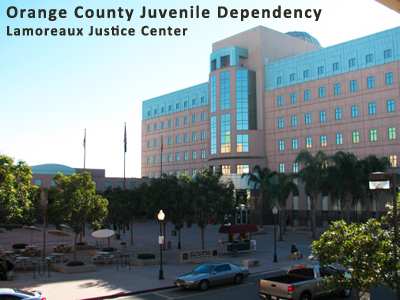 The court is adjacent to the California Juvenile Hall, and very close to the Youth Guidance Center and next door to both the California Juvenile Probation department and the Theo Lacy Juvenile Annex. This court hears matters concerning abuse or neglect to determine whether a child should be made a dependent of the Court. If Juvenile Court jurisdiction is established, the court will then determine whether the child should be removed from the parent’s custody and, if so, what placement would be more appropriate for the child’s needs. Services are offered to parents to assist them in the proper care of their children. Social Workers and other professionals assist the court in evaluating the needs of children. Dependency actions involve minors who have allegedly been abused, neglected, or inadequately cared for by one or more parents. The jurisdiction prerequisites for such proceedings are described in Welfare and Institutions Code Section 300. Unlike delinquency or status offender proceedings (where the principal focus is on the conduct of the minor), dependency proceedings are to ensure the safety and well-being of the minor. If Juvenile Court jurisdiction is established, the court will then determine whether the minor should be removed from the parent’s custody and, if so, what placement would be most appropriate for the minor’s needs.